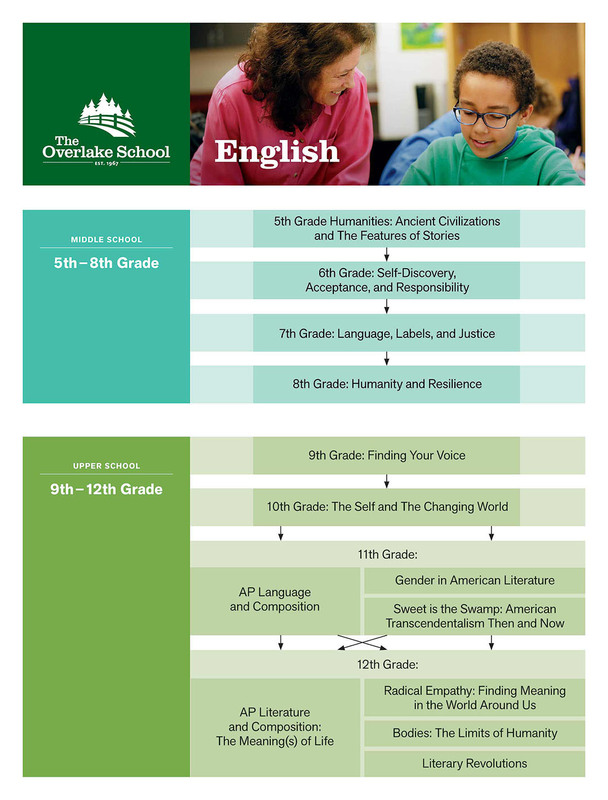 The Overlake English Department fosters a passion for learning through the study of literature and writing. By cultivating students’ abilities to think critically, read closely, and communicate effectively, we aim to inspire and empower students to become active participants in a diverse and global society. The Overlake English Department values the power of student voice and student choice. Our classrooms are safe places where students experience mutual respect among peers and adults, where they feel heard, and where their opinions matter. We value risk-taking, as we believe that the best learning takes place on the edges of discomfort. We believe our role as teacher is to foster a community of thinkers while modeling the authenticity and curiosity we hope our students come to embrace. Community: We facilitate collaboration among students so that they a) carefully consider their peers’ opinions, b) approach writing as a collaborative process that enriches their thinking, and c) confidently and competently join existing conversations about the larger questions of humanity. Authenticity: We expose students to a range of perspectives in literature so that they a) see their identities affirmed and discover their voices, b) build empathy through exploring different experiences, and c) develop a deep appreciation for the variety of lived experiences around the globe. Curiosity: We create learning environments so that students a) feel safe and empowered to take risks, b) think and communicate, both critically and creatively, about literature and the questions it provokes, and c) develop a love for reading that extends beyond the humanities classroom. To learn more about the values surrounding the essential skills in English classes, read the English Department mission. Upper School students are required to take four full years of English. English 9 and 10 are required. Juniors and seniors choose one full-year elective. English Department Policy requires that all students in grades 5-12 bring print copy books with the ISBN specified by the teacher rather than other editions or e-readers for in-class studies. This allows students to access the page and paragraph being discussed easily and provides a richer and less stressful learning experience for all. If using a previously annotated text, please be sure to have your students annotate in a manner readily distinguishable from the notes already in the book. How does exposition impact a story? How do we determine the theme of a story? How does the protagonist’s central conflict help us determine the climax of a story? For language arts, students practice close reading skills, strategies for vocabulary development, and effective presentation techniques. Writing focuses on developing an argument through the use of evidence and analysis. In addition, grammar is taught as a fundamental part of the writing process, and students regularly address these skills within their written work. 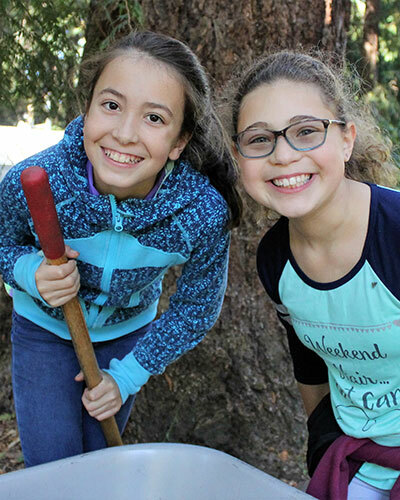 In conjunction with the ancient civilizations curriculum, students read a selection of short stories including "The Dog of Pompeii," "The Lady or the Tiger," “The All-American Slurp,” and "Ho-ichi the Earless." Students also read two novels, Same Sun Here, and a retelling of The Odyssey. How do we discover who we are, especially within the context of our heritage and families? How do we accept ourselves, including our strengths and idiosyncrasies? What is our responsibility to our community and society? 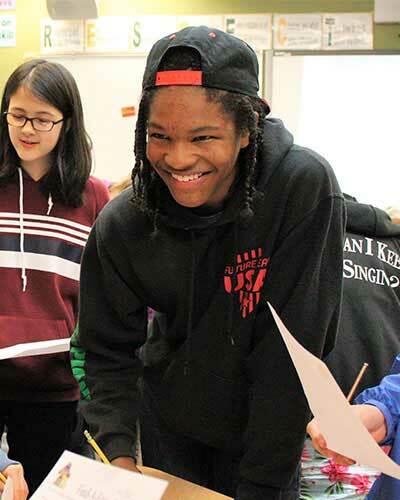 Through exposure to a variety of texts including poetry, short stories, novels, and plays, students learn to read critically for details, recognize figurative language, and interpret developments in plot, character, setting, and theme. In class discussions and activities, students use textual evidence to support their own thinking and evaluate classmates’ ideas. Texts include The Girl Who Drank the Moon, The Crossover, Wonder, A Mango-Shaped Space, Rain Reign, The War that Saved My Life, Gracefully Grayson, Wolf Hollow, The Giver, and various short stories and poetry. Writing instruction includes both analytical, multi-paragraph writing as well as creative exercises in poetry and personal narrative. Within these forms, instruction emphasizes increasingly complex and varied sentence structure as well as careful word choice. With guidance, students will revise and edit their own writing as well as that of their peers, paying close attention to organization, style, and the proper grammar, usage, and mechanics of the English language. Finally, students will acquire and utilize new vocabulary through close reading as well as careful study of the vocabulary text, Sadlier-Oxford Vocabulary Workshop Level B. How do we determine a person's worth? What does it take to affect the world around us? In order to explore these questions, students will read various novels, two plays, and a memoir. Among the texts used are Unwind, The Boy in the Striped Pajamas, To Kill a Mockingbird, Inherit the Wind, A Midsummer Night’s Dream, and A Long Way Gone: Diary of a Boy Soldier. The reading is taught in conjunction with a study of writing, vocabulary, and grammar. Students will use these skills to grow as thinkers and communicators, developing precise and thoughtful analyses and engaging in various projects to help them clarify the relationship between their studies and the world they live in now. In addition, each quarter students will read and reflect on books of their own choice in several assigned genres. Ultimately, seventh grade students will finish the year with a greater understanding of how to express themselves constructively and effectively while continuing to foster their love of exploring worlds through reading. 1st semester: Testing our mettle: How do we show resilience? 2nd semester: What does it mean to be human? Through literature, writing assignments, and discussion, eighth graders consider these age-old questions, seeking to understand more about themselves, others, and characters in our texts. Novels typically include Midnighters, A Separate Peace, Of Mice and Men, A Gathering of Old Men, and Half Brother. In addition, students study other genres, which may include short stories, non-fiction, poetry, vignettes, and drama (Romeo and Juliet, “Thunder on Sycamore Street”). The program emphasizes a formal approach to writing via structured paragraphs and multi-paragraph essays, with special attention to word choice, sentence structure, provable root sentences, effective transitions, introductions, and conclusions. In addition, students write poetry and short stories, practicing creative writing techniques such as the use of figurative language, line breaks, rhyme, character development, tag lines, dialogue, and story structure. Eighth graders further develop communication skills through leading discussions, presenting their writing and delivering speeches. Literature and writing components are supplemented by continued study of grammar, usage, mechanics, and vocabulary. The theme for English 9 is finding one’s voice, which we will explore through the essential questions: What is your unique voice and how is your voice shaped? Throughout the year students will be challenged to find, use, and expand their voices, as well as to examine the voices of the authors we study. This course features a variety of active learning opportunities including seminar-style discussions, group presentations, formal speeches, dramatic vignettes, and impromptu speeches. Writing projects include formal analytical essays, short stories, and poetry. Students will exercise their vocal chords, their keyboards, and their brains! Evaluating the process will be as important as evaluating the final product, and students will self-reflect on their progress as readers, writers, speakers, and critical thinkers throughout the duration of the course. Readings will include a variety of classic and modern short stories, as well as key texts such as Macbeth and Lord of the Flies. Students will also read works from authors of diverse backgrounds such as “The Flowers” and House on Mango Street. Throughout the year, students will read a collection of modern poetry by a variety of authors. Grammar, vocabulary, and the basics of preparing for and writing a research paper are also integral skills in the course. Join the journey and find your voice! English 10 explores the elements of literature and the power of language through a diversity of works from across the world and literary time-periods. Students practice short and longer formal literary analysis essays, journaling, and creative writing with a particular emphasis on developing a deliberate and effective writing process. Based on teacher and peer feedback, students analyze and track their writing progress from one assignment to the next and set goals for improvement on subsequent essays. In the classroom students develop speaking, listening, and critical thinking skills through seminar-style discussions, collaborative work, and oratory practice. Students have the opportunity to participate in a formal debate as well as lead the class as teacher-for-the-day at the end of the year. Major texts may include summer reading, Othello, My Children! My Africa!, The Kite Runner, and additional short stories and poems. Formal writing conventions and the study of vocabulary are also emphasized in the course. Emily Dickinson writes, “Sweet is the swamp with its secrets.” She revels in every aspect of the natural world and finds mystery, inspiration, and her own humanity through experience and analysis. This course will explore the varieties of experience in nature across numerous expressions of American culture. Essays, reflections, novels, poems, and a play will become bridges for class members to explore how nature and place impact identity, culture, sexuality, race, and philosophy. 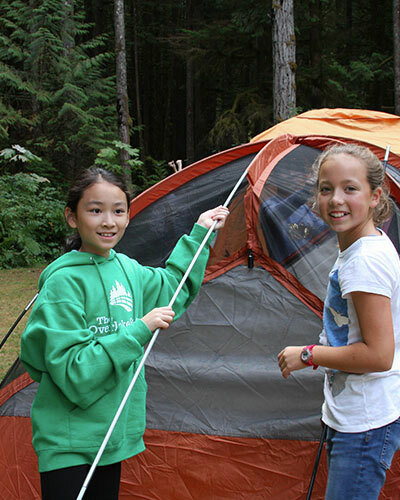 Students will engage with the texts and in nature. Students will write to reflect and analyze, build on prior knowledge, and synthesize ideas over the school year through the essential question: what is the value of nature? In the process, students will build upon and systematically organize their own “aesthetic” pertaining to the natural world. We will read from the American Transcendentalists: Thoreau, Whitman, Dickinson, Melville, and Emerson. If transcend means “to go beyond”—American Transcendentalism heartily sought to engage in both the physical world (matter matters) and the world signified “beyond” the thing itself, those secrets of Dickinson’s swamp and the physical world and its “metaphysical” sides. Writing assignments will include: literary analysis, personal essay, the research paper, poetry, free writing, and a strong focus on revision. What do we really mean when we say “man up”? What does it really mean to “throw like a girl?” What happens when girls do math and boys wear pink? In other words, what constitutes masculinity or femininity? How are male and female roles defined? From the music of Madonna to Macklemore, and from the classic television of I Love Lucy to The A-Team, twentieth-century popular culture has been preoccupied with these questions. And twentieth-century American literature has followed suit. Through a variety of literary genres, as well through popular culture, we will explore how gender identities, expressions, and roles are constructed and challenged. We will also consider the ways that our very understanding of gender has evolved to move beyond these binary constructs. We will spend the first semester examining traditional gender roles and binary definitions of gender, reading authors such as Kate Chopin, F. Scott Fitzgerald, Zora Neale Hurston, Tennessee Williams, August Wilson, and Ken Kesey. In the second semester, we will consider non-binary definitions of gender both as experienced by the individual and as lived out in society as a whole, reading authors such as Louise Erdrich and Ursula Le Guin. By exploring these questions, this course aims to provide a glimpse into major American time periods and literary styles. Students will also become familiar with key themes in American literature, including the pursuit of the American Dream, the lure of the past, the struggle for power, the desire for justice, and the hope of belonging. Ultimately, the goal is for students to see their own identity constructs mirrored in the literature they read and to see the relevance of American literary themes in general. Students will respond to these issues through formal literary analysis, informal journal responses, and online discussion posts. Opportunities for developing speaking skills include seminar-style discussions, formal presentations, dramatic monologues, and scene enactments. American literature students will also continue their study of vocabulary and grammar. As a junior year English course, AP Language and Composition focuses primarily on non-fiction texts from the American literary canon. Students respond directly to a wide variety of American readings from the early years of democracy to contemporary life: letters, speeches, essays, novels, short fiction, articles, and image-based texts. In addition to the chief emphasis on non-fiction and political rhetoric, other anchor texts for the course include The Great Gatsby and The Things They Carried. The course addresses the essential questions of the American experience: What is the American Dream of success, and have all groups had an equal opportunity to pursue it? What are the philosophical underpinnings of American social and political thought, and how do Americans approach and respond to conflict in these realms? In the fall, students delve into the elements of rhetoric that authors use to influence audience: the classical rhetorical appeals, tropes, schemes, tone, syntax, diction, imagery, and symbolism. Spring work includes mastering the formal elements of logical argument and the researched synthesis argument essay on an issue of controversy in American society. Students use these understandings and close reading habits to improve their own writing through emulation and adaptation. The end goal is for students to use the lens of rhetoric to comprehend and evaluate any text by analyzing language with critical precision. For a complete course outline, visit the College Board AP English Language and Composition Course Description. This senior elective will explore central questions surrounding what it means to engage meaningfully in the world: What do people seek in their connections with others? Why? What do we pursue in our lives and why are those things important to us? How do humans respond to hardship and pain? What is authentic empathy, and what role does it play in our daily interactions with others? The class will read novels, short stories, essays, and poems, with primary readings from Colum McCann, Kazuo Ishiguro, and Sonali Deraniyagala. In addition to exploring the questions through the readings, students will grapple with their ideas in analytical and reflective writing, including a research paper and capstone project. The course will push students to develop their reading, writing, and discussion skills so that they can think more deeply about their own experiences in the present and be fully prepared for the challenges they encounter in the future. This course explores how humorous genres express and critique personal, political, and social realities around the world and close to home. We will also examine the dangers inherent in such controversial expression and the power that humor can bring to marginalized voices. The course considers satire, parody, and humor found in essays, stories, poetry, drama, songs, political cartoons, memes, film, television, and stand-up comedy. We will also examine current libel laws, the extent of free speech, disgraced writers/performers, and banned texts. Students will write analytical pieces, teach class material, practice emulating humorous forms, complete the senior research paper, and perform or create a final capstone project that is seriously funny. AP English Literature and Composition is designed to provide students with a college-level approach to reading, writing, and critical analysis in advance of the National Exam in May. Students will examine a wide range of genres and periods, ranging from Antiquity to the 21st Century, in order to consider how and why authors create meaning in various texts. They will read poetry, prose, drama and satire, as well as philosophical works and literary theory in order to provide insight into questions of textual production, authorship, theme, and symbolism. Students will be asked to consider how certain topics, such as identity, power, trust, love, oppression, isolation, and struggle are interpreted by authors in different cultures and time periods. Moreover, they will be encouraged to reflect upon how these universal ideas relate to their own lives. Through their writing assignments and projects (including a longer research paper), members of the class will get the opportunity to engage with broad questions by means of close analysis. In other words, they will use their interpretations of specific texts as a way to think about universal dilemmas. To learn more about electives that the English Department has offered in previous years, view a sample of historical English courses.